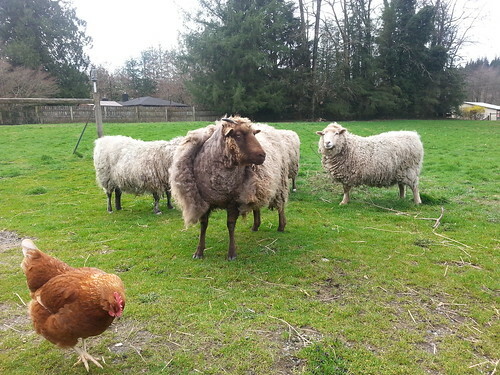 Shearing Edgar is always fun. I sit on a rock, and he casually saunters over. I let him sniff the shears and ask him if he wants a little off the top. I usually start right behind the ears, carefully opening up a pathway through his lovely lanolin-y wool. Once I’ve got the back of his neck uncovered, I give him a little massage. 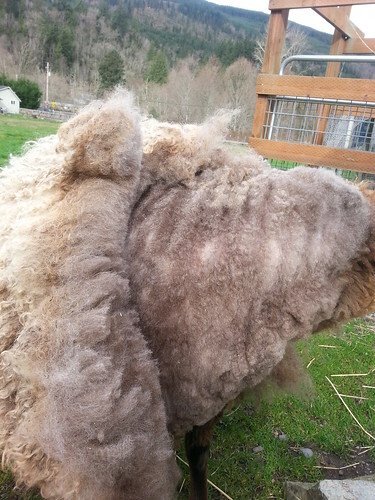 I think the massage is why he likes getting sheared so much- that and feeling the spring air on his skin for the first time in many months. He occasionally gets fidgety and needs to take a little break, so I try to not have too much wool hanging off of him at any point. I pull it off and collect it in my muck-bucket as I go. We always and up doing the haircut in stages. Stage one is the Mullet. 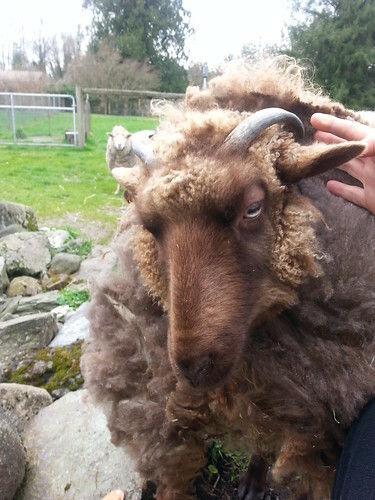 His nicest wool is on the front end, so I’m fine with letting him hang out for a while in Mullet Mode. None of the other guys are quite so eager for me to take the shears to them, so they’ll need to be haltered. But it’s always nice kick off shearing season with my buddy Edgar. I also wanted to mention the the ChickieCam is back! Chicks are just over a week old now and getting some of their big-girl feathers in. Super cute. Next: One more time, with feeling!